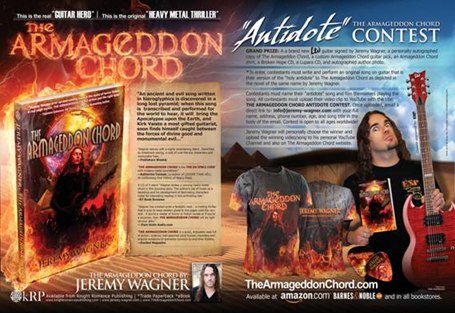 Author/heavy metal guitarist JEREMY WAGNER, ESP Guitars and Guitar World magazine recently teamed up to bring you THE ARMAGEDDON CHORD “Antidote” Contest! The grand prize winner will be awarded a brand new LTD guitar signed by Jeremy Wagner, a personally autographed copy of THE ARMAGEDDON CHORD, a custom THE ARMAGEDDON CHORD guitar pick, a THE ARMAGEDDON CHORD shirt, a Broken Hope CD, a Lupara CD, and an autographed author photo. Fans should enter to win soon; the contest ends on Thanksgiving, Thursday, November 24th. To enter, contestants must write and perform an original song on guitar that is their version of the “holy antidote” to THE ARMAGEDDON CHORD as depicted in the novel. Contestants must name their “antidote” song and film themselves playing the song. All contestants must upload their video clip to YouTube with the title: THE ARMAGEDDON CHORD ANTIDOTE CONTEST. Once uploaded, email a direct link to info@jeremy-wagner.com with your full name, address, phone number, age and song title in the body of the email. Contest is open to all ages worldwide! Last chance entries should be uploaded and emailed to info@jeremy-wagner.com no later than 12:00AM CST (US) on November 24th for consideration. JEREMY WAGNER will personally choose the winner and upload the winning video/song to his personal YouTube Channel and also on THE ARMAGEDDON CHORD website. Go out and purchase your copy of Guitar World’s “Big 4” issue or Revolver Magazine’s “Slipknot Tribute” issue now for contest details! JEREMY WAGNER released his debut novel, THE ARMAGEDDON CHORD on August 22nd, 2011. THE ARMAGEDDON CHORD peaked at #4 this in it’s first week on the Barnes & Noble Top 10 “paperback” Bestseller list and peaked at #9 on the Top 100 overall Bestseller list. JEREMY WAGNER has written lyrics to more than 70 published songs along with recording six albums, two MTV videos, and touring in 16 countries with his bands, Broken Hope and Lupara. WAGNER has been published in RIP Magazine, Terrorizer, Metal Edge, Microhorror and works of short through Perseus Books, St. Martin’s Press, and Ravenous Romance. JEREMY WAGNER is currently endorsed by ESP Guitars.